My final blog in this series on biologic strategies for repairing joint damage focuses on leading edge treatments designed to stimulate the regeneration of new hyaline cartilage: Osteochondral Autograft Transplantation (OATS or Mosaicplasty), Osteochondral Allograft Transplantation, Autologous Chondrocyte Implantation (ACI) and Stem Cell and Tissue engineering. Unlike PRP (platelet rich plasma) or drilling, abrasion and microfracture techniques which are designed to stimulate the growth of fibrocartilage, these procedures offer the potential to replace lost hyaline cartilage with regenerated hyaline cartilage. The advantage in replenishing hyaline cartilage is to recreate a normal joint milieu which could result in long-term pain relief, improved function and the potential to stop the progression of more extensive osteoarthritis (OA). The OATS procedure refers to Osteochondral Autograft Transplantation (also called Osteochondral Autograft Resurfacing and Mosaicplasty), during which a plug of cartilage cells with the underlying bone is harvested from a non-weight bearing area of the patient’s joint. A similar size plug is removed from the damaged area and the plugs are press-fitted into the opening. Viable and immediately available, hyaline cartilage is being supplied and the implanted plug can heal to the surrounding living bone. Although technically more involved than microfracture or drilling techniques, this procedure has the advantage of filling the chondral defect with autogenous hyaline cartilage and can reconstitute a normal height (unlike the other techniques) and shape to the defect and impart normal mechanical properties. This procedure is best for small defects, 15-20 mm in size (less than one inch), due to a limited number of available harvest sites. Transplantation can be performed using a single plug or by creating a mosaicplasty where multiple plugs are used. This technique is used mainly for isolated osteoarthritic or traumatic lesions and not for general cartilage loss from genetic disease or inflammatory arthritis. Although the OATS procedure can be used to treat isolated hip arthritic lesions, it is technically difficult and used much less commonly. Typically, the graft would be harvested from the knee on the same side rather than the hip. 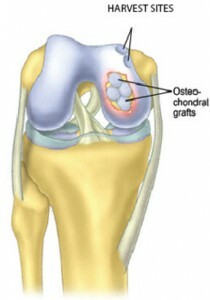 Osteochondral Allograft Resurfacing/Mosaicplasty is similar to OATS except cadaveric donor bone and cartilage are used. Although developed more than 30 years ago with some surprisingly good results, it has not been used extensively due partially to the difficulty in obtaining fresh grafts (the cartilage cells must be alive when they are transplanted) that can be matched, screened and tested for pathogens. One major advantage is that much larger grafts can be implanted. A potential concern is the risk of a transferable disease, although with modern testing that risk is very small. The hope is with continued improvement in our system of cadaveric banking, this technique can be used more widely. Autologous Chondrocyte Implantation (ACI) is a groundbreaking technique which has the potential to regenerate lost hyaline cartilage with new hyaline cartilage by transplanting autogenous cartilage cells taken directly from the patient and grown in a laboratory prior to re-implantation. This is a two-step process where healthy cartilage cells are removed arthroscopically from a non-weight bearing part of the patient’s joint, grown in a special laboratory over a four to six week period until a critical number is available, and then implanted in the cartilage defect during a second surgery. 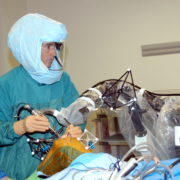 Traditionally, the re-implantation is accomplished through an open procedure rather than arthroscopically. During re-implantation, periosteum, which is a layer of tissue that naturally covers the bone, is harvested from one location and sewn over the cartilage defect. The new cartilage cells then are injected under this periosteum patch with fibrin glue to promote the growth of new hyaline cartilage cells. A disadvantage of this procedure is that the normal and highly complex structure of hyaline cartilage is not fully regenerated. Also, it requires a second open procedure. Once again, patients are typically involved in physical therapy after each procedure and their weight bearing is restricted after the second re-implantation procedure to promote early healing and prevent graft disruption. 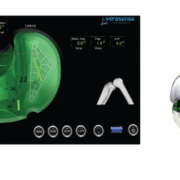 New methods are being developed which could allow the injection of material into the cartilage lesion to function as a bio-membrane or scaffolding, thus eliminating the need to harvest periosteum and perform the second surgery arthroscopically rather than an open surgery. These techniques have not been approved yet in the U.S.
Tissue Engineering is a recently developed science that merges the fields of cell biology, engineering and material science with surgery and focuses on the art of utilizing biological material to generate new tissue to replace worn out or lost natural tissue. This new tissue mimics the function of the original tissue. Current research is being focused on Stem Cells to make the body grow healthy cartilage tissue. There are three critical components to tissue engineering of cartilage. First, supplying sufficient numbers of the special types of cells into the defect (i.e. chondrocytes or multipotent stem cells) that are capable of differentiating into chondrocytes (specifically, hyaline cartilage cells). Second, it requires optimum access to growth and differentiation factors that biologically stimulate these cells to separate into hyaline cartilage. Third, optimizing a cell carrier or matrix that fills the defect, delivers the appropriate cells and supports cell proliferation and differentiation. This still remains a “tall order.” Using this procedure to successfully replace damaged or diseased cartilage will depend on future advances in our understanding of the biology of cartilage and stem cells, as well as technological developments in engineering. At this time, tissue engineering procedures still are at the experimental stage and most of the research is being as part of clinical trials. Recall that the microfracture technique perforates through the chondral plate into the underlying bone marrow so the produced clot would include mesenchymal cells (MSC) that are present in many living tissues including bone marrow. When placed in a specific environment, mesenchymal stem cells have the potential to differentiate into host tissue similar to that environment. We have yet to discern the optimal source of mesenchymal stem cells. While bone marrow mesenchymal (bone marrow MSC) has been extensively studied, adipose (fat) derived stem cells (ADSC) now are emerging as an attractive alternative. Embryonic stem cells also have shown the ability to self-renew and differentiate into a number of different cell types, including chondrocytes. I believe the future is both bright and very exciting for Stem Cells and Tissue Engineering with the use of Stem Cells. 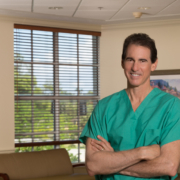 As a surgeon, I always am interested in new methods to heal degenerative joints, but enthusiasm for leading-edge procedures has to be matched by time-tested and successful patient trials. I do not do procedures designed to grow hyaline cartilage. Consider being evaluated by an orthopedist who specializes in joint preservation. We thank you for your readership. General comments will be answered in as timely a manner as possible.